K-Rex 2nd in USF 2K 2017 Championship after Barber Motorsports Park Races 3 & 4!! LEEDS, Ala. (April 24, 2017) – Kaylen Frederick, the youngest Mazda Road to Indy driver in the paddock, clinched his first MRTI podiums as he drove the yellow #81 Pilot One Racing Team Pelfrey machine to two second place finishes in rounds three and four of the Cooper Tires USF2000 Championship! The team staged their Tatuus USF-17 Mazda powered cars on pit lane for the first twenty-minute qualifying session around the 2.83-mile road course on Friday morning. With Kaylen leading the fast lap charts in the opening laps of qualifying, Pelfrey drivers were quickly up to speed. Drivers struggled to find clear laps while running in traffic. With minutes remaining in the 20 minute session and on fresh tires, Kaylen placed himself in second and on the front row of the grid. The first race of the weekend, round three of the championship, got underway later that afternoon, and the #PelfreyPower trio got to work applying heavy pressure on the competition throughout. Oliver Askew secured a slight advantage at race start and held onto the lead, while Kaylen held onto the 2nd spot from the challenger Rinus Veekay from Holland. Kaylen and the leader opened up a comfortable gap on the rest of the field allowing Kaylen to focus on chasing the leader. Although Kaylen frequently brought the gap to within 4 tenths of a second he was unable to get underneath Askew in the corners. Kaylen remained close behind but had to settle for second, just 0.2273 seconds behind at the finish. Having driven the fastest lap in the race added another point to Kaylen’s points for the day as well as the series Staubli Award. Saturday morning brought about the second leg of qualifying, and the Pelfrey trio found themselves in similar positions to Friday’s qualifying session. With only one set of slicks remaining for the day out of the 3 tire set allotments, Qualifying was run on a one-tire-set strategy. Kaylen and teammates rolled out to acclimate themselves with the track grip on used tires. Kaylen led the field for half the session until new tires were installed. 3 laps into his new tire run, Kaylen rose to the top again, but was again eclipsed in the closing minute by Oliver Askew. Earning the front row of the grid in 2nd place, Kaylen led the Team Pelfrey effort again. As the green flag waved in the late afternoon sunshine to start the Mazda USF2000 Grand Prix of Alabama, Askew held the advantage over 14-year old Frederick. However, that didn’t stop the yellow #PelfreyPower machine from putting tremendous pressure on Askew once again during the 30-minute race. Kaylen once again claimed the bonus point for fastest race lap – but his hopes of snatching the win effectively evaporated on Lap 11 when he carried a little too much speed into Turn One, bobbled wide on the exit and lost a couple of seconds to his primary rival. Kaylen recovered and held his position, although this effectively ended his hunt to chase down the leader. Kaylen then opened up his large gap again on the pursuers and crossed the line in 2nd place at the checkered flag. In a strong USF 2000 twenty-four car field at Barber Motorsports Park in Leeds Alabama, K-Rex finished with two strong performances netting 2nd in Qualifying and 2nd in both races. These solid performances raised Kaylen’s standings in the USF 2000 Championship to a tie for 2nd place. 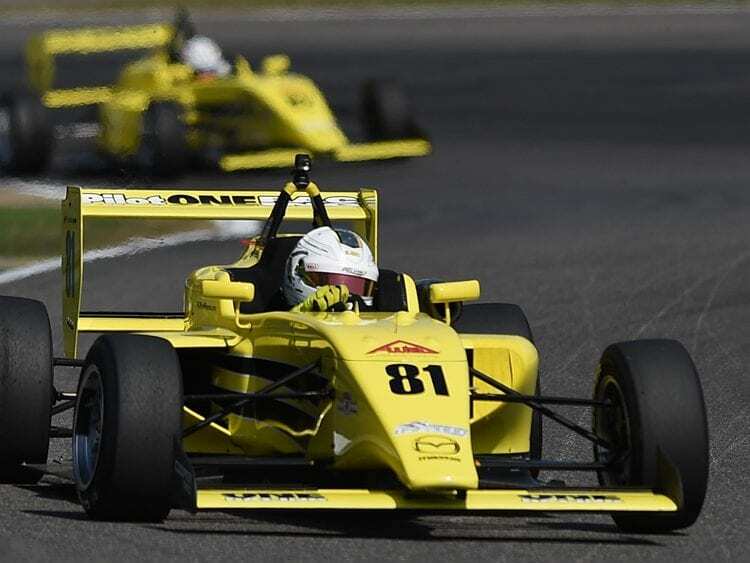 Thought by many to be the most competitive USF 2000 field ever, Kaylen Frederick established himself as a fourteen year old force to be reckoned with!